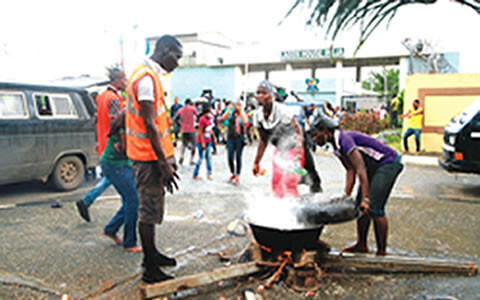 According to a report from PUNCH The Lagos State University students on Thursday stormed the office of Governor Babatunde Fashola at Alausa, Ikeja, and said they would not return home until their school fees were reduced and their arrested colleagues released unconditionally. The students, who arrived at the office at about 3pm in over 10 buses, came along with mats, mosquito nets and cooking pots, among others. To show their seriousness, the female students quickly swung into action, setting up firewoods to prepare beans near the entrance of the Governor’s Office.